on February 16, 2017, 9 a.m.
YouGov research finds that as much as 96% of APAC respondents have made vows to themselves for 2017. While saving resolution is the most common in the eyes of APAC respondents, health resolutions also come strong in their minds. But with the first month of 2017 now behind us, how many people are still keeping to their New Year’s resolutions? The top 5 New Year’s resolutions in APAC are: saving more money (67%), eating more healthily (52%), travelling to one or more place that they have never visited (48%), losing weight or getting fitter (46%), and getting a better work-to-life balance (39%). While saving more money stands as the top New Year’s resolution across all 9 APAC countries interviewed, Filipinos vow this most (82%), doubling the no. of Aussies who resolve the same for the new year (41%). Besides money, respondents from the Philippines and Vietnam also concern about appearance, with 43% and 57% of them saying they want to take more care of their appearance in the New Year. 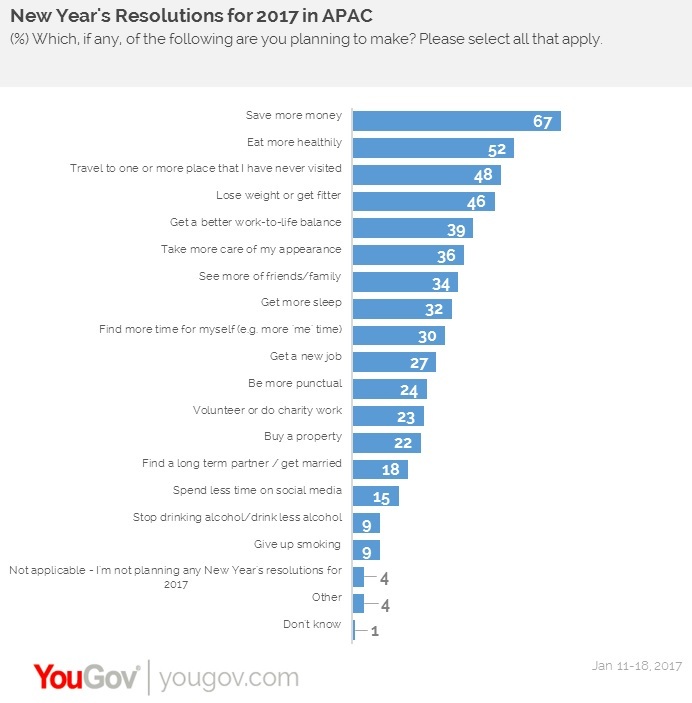 Different from the rest of APAC countries interviewed, getting groomed is also one of the top 5 New Year’s resolutions in these two countries. On the other hand, getting more sleep also emerges as one of the top 5 New Year’s resolutions in Australia (26%), Hong Kong (43%), Singapore (43%) and Thailand (38%); while seeing more of friends or family is also seen as top 5 in Indonesia (36%) and Vietnam (53%). Younger people are more likely to have made resolutions than their elder peers, with only 4% of those 16-34 year olds saying they are not planning to make any resolutions for 2017, compared to 24% of those 35+ year olds. Interestingly, one of five Aussies say they are not planning to make any resolutions for 2017, which is five times more than the regional average (4%), and twenty times more than China (1%) and Indonesia (2%). This is in line with the findings that almost three of ten Aussies (27%) say they actually never make New Year’s resolutions in their lives, which is more than doubling the regional average of 12%. With the first month of 2017 now over, how long further can people keep their New Year’s resolutions? Half of the respondents say that on average they manage to keep to their resolutions more than a month, whilst 38% break them within a month time. Though younger people are more likely to make New Year’s resolutions, they are also more likely to break their resolutions compared to the older generations. 44% of 16-34 year olds say on average it takes up to a month to break the New Year’s resolutions, while only 31% of those 35+ year olds say the same. More than one in five respondents in China say they never tend to break new year resolutions (22%), which is much higher than the regional average of 16%, and doubling the no. of Filipinos who say so (11%). Want to know what are the British’s resolutions for the New Year? Take a look at our UK survey.